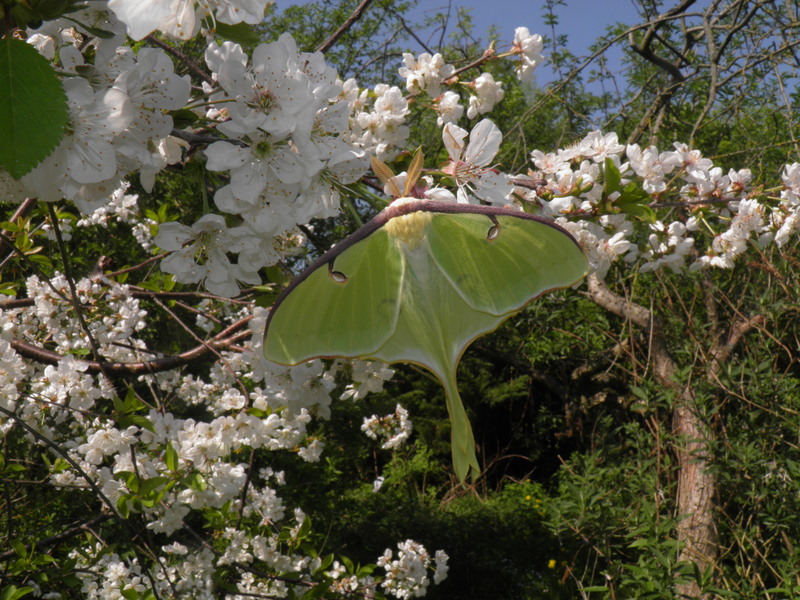 Actias luna — “American moon moth” | Welcome, visitor! 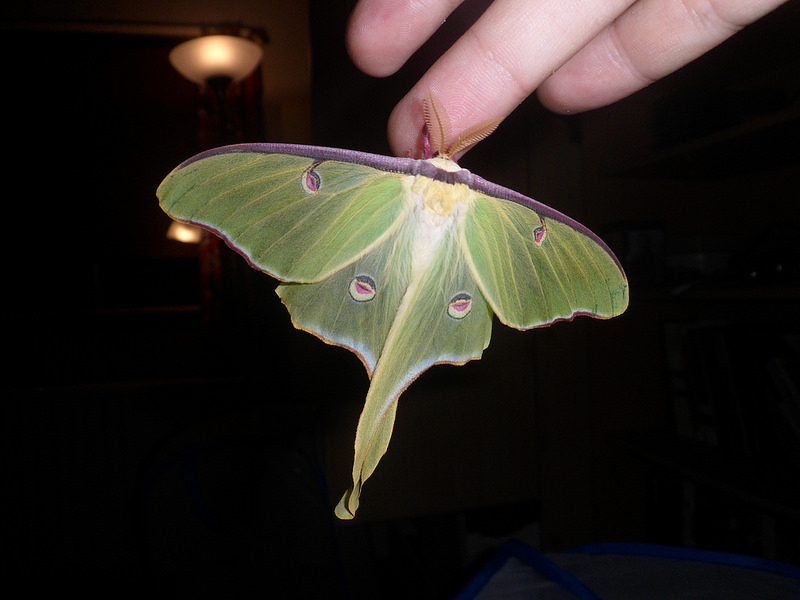 Actias luna is one of the more common silkmoths of North America, and the only species of moon moth in America. It is also the most culturally recognised species, often shown as the “standard” type of moon moth in culture, and a favoured insect of American entomologists for its beauty. It occurs all the way from Canada to the United Stated to Mexico, giving this insect an enormous distribution; however, in all these locations they are only found on the east-coast along the entire continent of America. Difficulty rating: Easy – Easy in all regards and suited for beginners. Generations: Uni/bi/multivoltine. Not continuously brooded, will overwinter – produces one to four generations a year depending on local climate, with multiple generations in warm habitats but only one per year in cold habitats such as Canada – but will always enter diapause before winter — so it depends on daylength, temperature and the consecutive generation. Originating from North America, they cover a large range on the East-coast, all the way from Canada to Texas. Because of the large difference in climate in their range, their life cycle varies depending on their habitat – Canada is quite cold with harsh winters where temperature may even dip below -20C, while Texas is effectively a desert and quite hot. They may have 1 to 3 generation per year in the wild depending on their habitat, having only 1 generation in the colder areas up to 3 generations in the hotter areas. After the autumn generation, this species will go into diapause. The caterpillars are bright green and can be reared on the following plants: Birch (Betula), Walnut (Juglans), Oak (Quercus), Sweetgum (Liquidambar) and more. They have five instars in total, and spin a thin and tender cocoon among the leaves. Cocoons may overwinter. Pairings are quite easy and straightforward, although couples may refuse to pair if they are genetically closely related to eachother, as to prevent inbreeding. The moths should be left alone in a well ventilated cage in a spot with natural daylight. At night, the female will release pheromones and the males will be eager to pair with her. 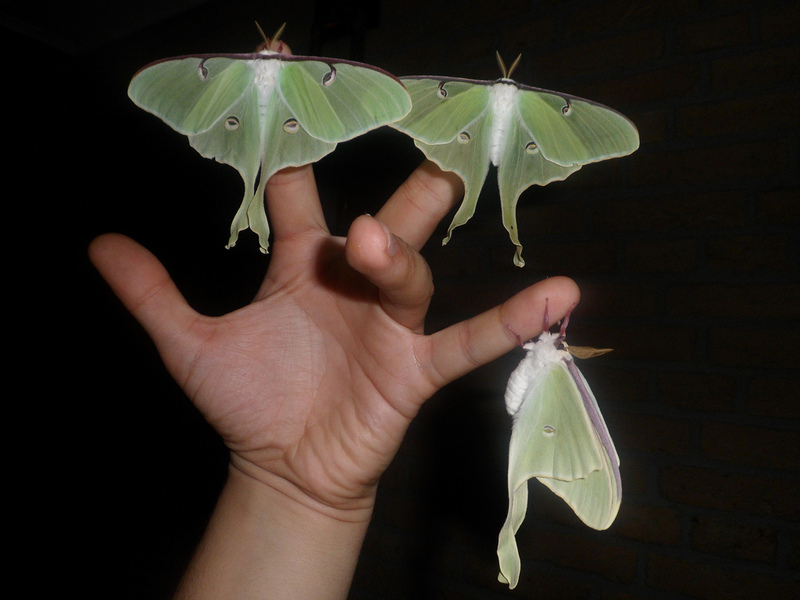 Handpairing is suprisingly frustrating with this easy to breed species (this is because the moths curve and wriggle their abdomens in fear if handled) – but it is still possible. I would not recommended it however, unless you have trouble archieving natural pairings (which seems unlikely). Actias luna will easily pair in cages in a house, but I prefer to put them outside for natural light and ventilation. Cold nights are no problem for this moth, which isn’t suprising given the fact there are populations that go as far north as Canada. 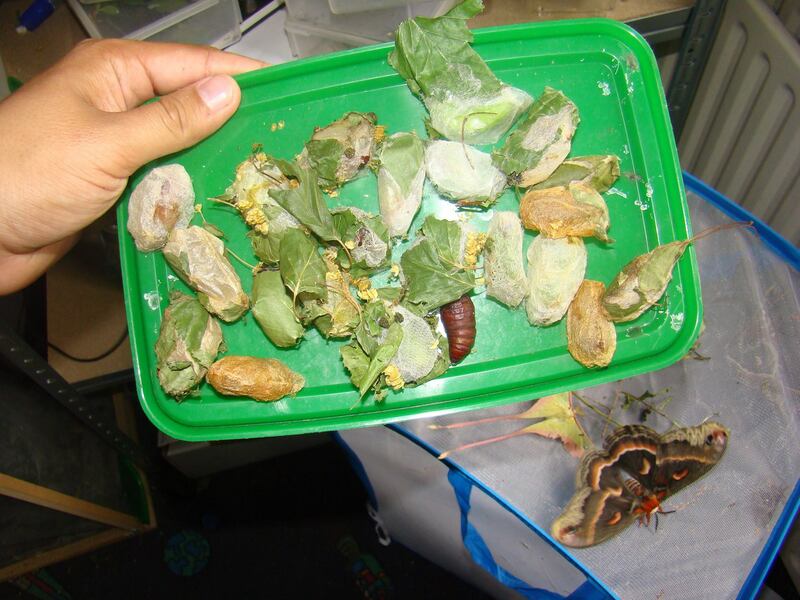 A pairing of Actias luna archieved in a rearing cage. The pairing of Actias luna does not last very long, but after the copula the moths usually stay together for 24 hours before parting ways. Rearing the caterpillars is easy if you don’t forget to give them proper ventilation. 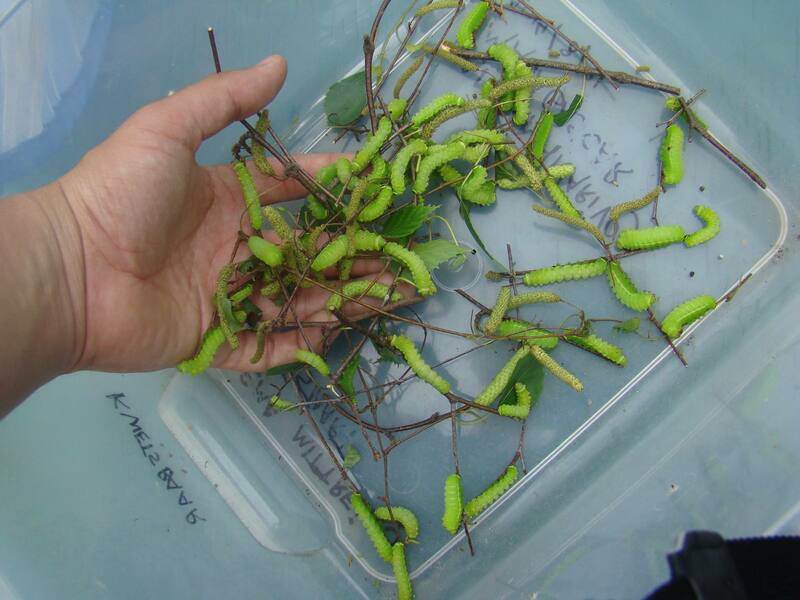 The caterpillars of Actias luna are quite though and can stand both cold and hot conditions and poor food quality, but when reared in an airtight plastic box, they will quickly become infected and die. The best is to rear them in a cage, a sleeve, or perhaps in a plastic container with the lid or sides removed and replaced with gauze/netting. The cocoons of Actias luna seem to be thin and papery. Instead of utilising a lot of silk, they prefer to use other material – mainly things such as leaves, moss or tree bark – and incorporate this material in their cocoons, by spinning them together with silk resulting in a well hidden and isolated cocoon. The cocoons of the overwintering generation are mainly thicker however, although there seems to be variation. 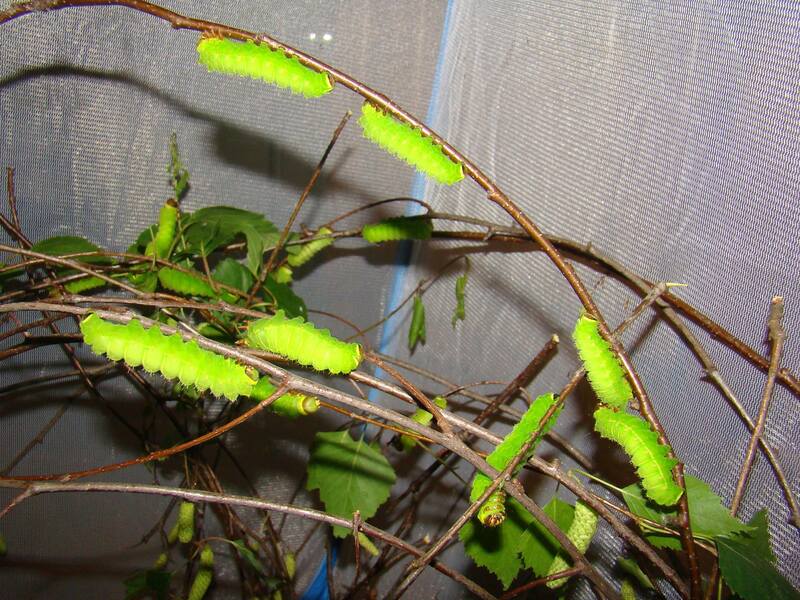 The cocoons are very hardy and can survive strong frost. The pupae of Actias luna are suprisingly active, and if touched they will wriggle inside the cocoons, producing an audible rattling sound. Not only do they move a lot if disturbed, it seems that the pupae also move a lot for seemingly no reason. 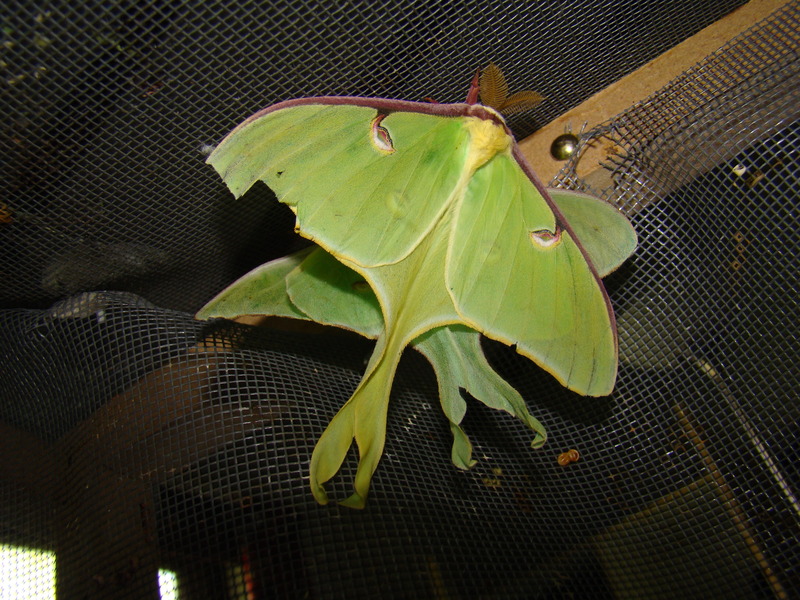 If one has a large stash of Actias luna cocoons in captivity, it isn’t uncommon to hear them move and rattle at night. Although not very variable in colour, their appearance may differ. Some luna moths will have a red border on their wings (“rubromarginata”). General shape and size of the wings may vary too, the eyespots, and the colour may vary from pale green/white to lighter green with even hints of flourescent yellow. This specie will do fine on room temperature in normal conditions. They don’t require much extra care except for plenty of food and hygiene.